Lusaka Mayor Miles Sampa has had his character questioned in view of his unwarranted recent behavior, particularly his failure to settle a meal bill at a Lusaka restaurant, Roan & Sable. And Patriotic Front deputy secretary general Mumbi Phiri has advised Sampa to humble himself. Sampa was challenged during an interview on Hot FM radio breakfast show this morning by presenter Mutale Mwanza who accused him of exhibiting strange behaviour lately. 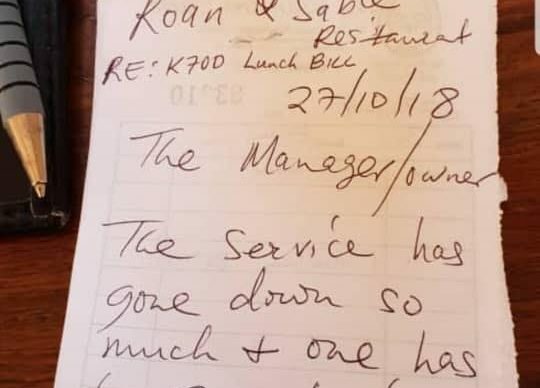 This was when she prodded Sampa to explain why he did not pay his K700 lunch bill at Roan & Sable restaurant, opting to leave a note instead claiming the service was poor. Sampa was quick to point out that the food was however “very tasty” despite the waiter having disappeared for 15 minutes before serving him and his guests. “Iam trying to bring sanity of service in the city. Yes, I wrote that note in order to drive a point to all Lusaka restaurants to up their game in terms of service. That bill of K700 is not a bill that the Lusaka Mayor can fail to sort out. Whoever is insinuating that should have a check-up at that hospital along the great east road (Chainama Hills Hospital for mental treatment). If it was a bill as high as K7,000 I would have cleared it, not such a small bill like this one,” He said. He said he was happy that his action had taken the media attention it deserved and that this meant his point had been driven home despite him not having paid the bill. However, when pressed by the interviewer on why he has been exhibiting strange behaviour in the recent past? Sampa avoided the question. Sampa refused to pay a lunch bill and instead wrote a small note to the manager indicating that he would only pay at the end of the month after the restaurant improved its services. And Mumbi Phiri called in to express her dissatisfaction about Sampa’s conduct saying he should have exhibited humility. Phiri said leadership required people to humble themselves before the majority of the people they aspire to serve. The Lusaka Mayor has recently exhibited questionable behavior, which included allegations of kidnap he confirmed to the local and international media in animated style. This was followed it up with a dramatic Facebook post of himself brandishing a gun and daring his alleged kidnappers that he would take them on. However, Sampa pulled down his post and apologized to his party leadership saying he was mistaken and was not actually kidnapped. Sampa promised to shut down all his social media accounts but opened them again within a week.